Mostly all the modern vehicles on the road now have an EGR system (Exhaust Gas Recirculation). The EGR makes use of an EGR valve which often wears out due to lack of maintenance and results in a poor performance. In this article, we will discuss the symptoms you might notice if the EGR valve is damaged and how to take care of the situation. EGR valves are a part known for failing often and it can result in an expensive replacement cost. The EGR valves have to withstand a lot of wear and tear because of the hot air and the amount of carbon that gets built up inside them. But is it cheap or expensive to replace it? Can I replace it at home? In this article, I will answer these questions for you. Exhaust Gas Recirculation sounds like a self-explanatory term but its application is a little complicated yet sophisticated. The EGR system recirculates the exhaust gasses back into the inlet manifold and uses them for combustion. This process not only reduces the harmful emissions of NOx but also helps the car to stay within the legal pollution limit. As the exhaust gas is recirculated, the combustion temperature reduces, preventing the production of NOx. There are some disadvantages of EGR as well such as loss in fuel economy, low performance and in diesel-engine cars, the production of soot increases. However, modern engines use clever technologies for an efficient process, for example, new diesel engines now use EGR cooler which cools down the exhaust gasses by passing the coolant. 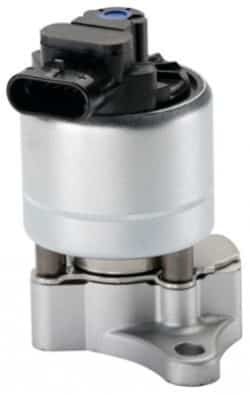 The two main issues EGR valves face are that, either the valve stays open or it shuts completely. Here are some common symptoms you will notice if you have a bad EGR valve. This happens when the engine is at a low RPM and the EGR valve remains open allowing additional gasses ultimately resulting in the performance drop of the engine. If the EGR valve stays open at all times and the exhaust fumes are being fed to the engine constantly, the engine gets deprived of oxygen. With too much fuel burning and less oxygen, a black smoke gets produced and escapes from the exhaust pipe especially when the car is idle. With the incorrect fuel/air supply, the engine will not function properly and this will result in the drop in fuel economy. If you notice that the engine is stalling at higher revs, it is possibly due to a bad EGR valve. This can also result in the engine getting choked. If the EGR Valve & Cooler remains closed and the exhaust gasses are not cooled down, the engine’s temperature will rise significantly. As the engine overheats, it breaks down the motor oil which is heading towards the turbocharger causing the turbocharger to fail. If the engine overheats too much, it will consume all the lubrication and will even start using its own engine oil instead of the diesel fuel. This will cause the engine to disintegrate. Where is my EGR valve located? If you want to find where your EGR is located in your engine bay, check around the intake manifold and you may have a big chance of finding it. It’s usually located with a pipe from the intake to the exhaust manifold. Due to the heat, the screws can be hard to remove after a while and there is a big chance that you will destroy the bolts when you are trying to remove them. Always spray a bit of 5-56 or WD40 on the screws before trying to remove it. Repairing an EGR valve can work sometimes, but in most cases, it will be cheaper to buy a new one. The older vacuum controlled EGR valves are easier to repair because the function is much simpler. If you have a vacuum controlled EGR valve, you can often replace the membrane inside it and clean it up to function as a new EGR valve. Newer EGR valves contain a lot of electric parts and can be really difficult to repair if you are not an expert. It can also be impossible to find parts to replace with inside the EGR. It’s most likely that you have to buy a new one. There are also cars with an electric EGR motor, but spring loaded valve. These can often get stuck and it can help to clean and lubricate the shaft to get them loose. If you considering cleaning your EGR valve, scrape away the carbon with a knife and clean it up several times with brake cleaner. After this, you can lubricate it with 5-56 or WD40 to make sure all parts are moving as they should. If you want to replace the EGR valve yourself, you should remember that if you have an electronic EGR valve, you have to use an OBD2 scanner to remove the trouble codes after the replacement and make a basic setting to the new EGR valve. If you are not relearning the parameters of the new EGR valve, you may end up with the same trouble code again, and you have to take it to the mechanic anyway. Now that you have concluded that the EGR Valve is faulty, it is time to repair it. You can either take it to the official dealership or try these methods to save some money. Mostly, the EGR valve gets dirty and clogged as it recirculates the gasses continuously. Follow these steps to clean the valve and remove blockage and notice if it functions properly. Make sure to not spray the cleaner on any other electrical component. Instead, buy an electrical which will help you clean those certain components. For newbies, we recommend that you take your car to an auto-specialist who can diagnose the problem effectively and provide you with a solution. On average, the EGR valve replacement should cost somewhere between $200 to $900. The component itself costs around $70 to $490. It’s often the repair time that is expensive. The diagnostic procedure depends a lot on if you have a vacuum controlled or electronic controlled EGR valve. Follow these steps before you are replacing your EGR valve. These steps down below are pretty advanced and you may have some knowledge about cars from before. Check the vacuum hose between the intake and the EGR. If it’s not holding pressure, replace the membrane if possible or replace the whole EGR unit. If the EGR valve is working properly, check the solenoid that is controlling the EGR valve, check if you got power and ground to it. Connect a car battery charger while you are doing the diagnostic procedure, to make sure the voltage in the car is good all the time while doing it. Open up the EGR valve and check for any corrosion/water infiltration inside the EGR valve or inside the connector and clean it up with electric cleaner if you find any corrosion. Reinstall the EGR valve and try again, if still faulty, replace the EGR Valve. 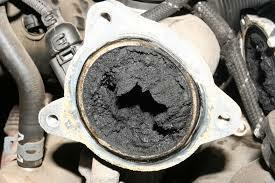 The EGR valve on a diesel engine does usually get a lot more dirt, and it has to be replaced and cleaned more often. The carbon build up can also destroy the EGR valve and you have to replace it more often. A lot of people, reprogram the EGR valve to not function to reduce the amount of carbon build up in the engine. Remember that this is against the law and bad for the enviroment. 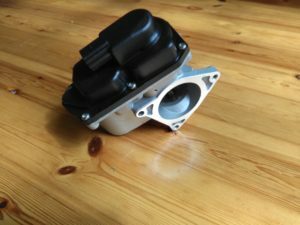 The average replacement cost of an EGR valve is between 200-450$, depending on what car model you have. Labour costs are most often between 50-150$ and the part cost is between 50-400$. Older cars to have a vacuum controlled EGR valve, and these are often much cheaper than the new electronic valves. A lot of the newer cars do also have an EGR cooler integrated with the EGR valve, and in many cases, you can’t replace just the electronic EGR unit, you have to replace both the cooler and the EGR valve (Volkswagen for example). If you have an old vacuum controlled EGR valve, you can expect around 100$ lower price than the electronic EGR valve. The Vacuum controlled EGR valves on older engines are often easier to replace also, which result in a cheaper labour cost also. Have you replaced your EGR valve yourself? How difficult was it? Was it worth to replace it yourself? Comment down below and let us know your thoughts about this! Hi i have a golfv gti 2005 model with axx motor code.I need to find out if the car is fitted with an EGR valve and where is it situated please.My car pushes all its exhuast gasses through the intake manifold back into the engin.intake manifold gets exstreamly hot in seconds. I guess you have a 2.0 tfsi engine and in that case, there is no EGR. I would recommend making a leak down test to see if the intake valves are okay! You can also check the camshaft timing. pleae reponsed me as soon as possible .